Sherlock Holmes Comic Strips, by Whatsits Galore. These Sherlock Holmes comic strips, which appeared in Mother Goose and Grimm by Mike Peters, are far too entertaining to be forgotten. Not only are they witty, but the artwork is delightful, giving us a charming and humourous look at the sleuth of Baker Street. 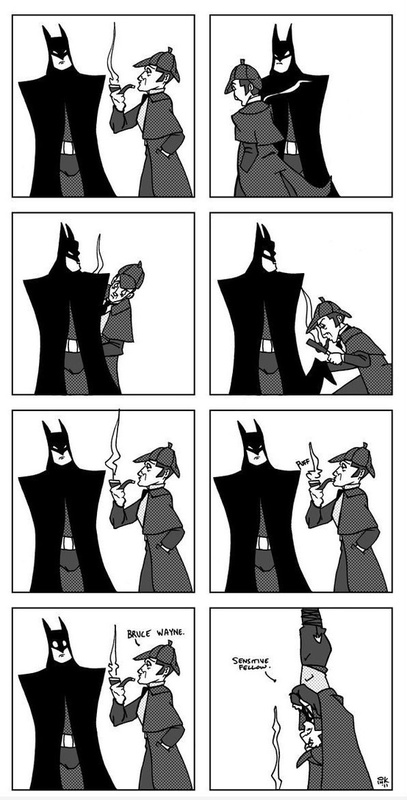 When Holmes meets Batman, the result is priceless! The original comic strip can be found on the Where's My Sammich website. Mike Peters' comics © Grimmy, Inc., King Features Syndicate, Inc.
Batman © DC Comics & Warner Bros., Inc.